The Intro of Patrician 2 is one of the best videos ever included in a game. After watching the intro the addiction has already packed one..it´s like a perfect begin of a brilliant Blockbuster! 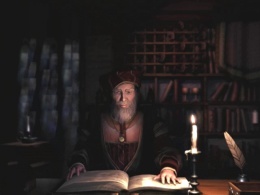 An old, experienced dealer sits at his table before a big book...this book contains the history of his life...an exciting and incredibly rich life.